Overall Nest Cam lays down a solid product; it stands out for the way it looks (whether you're a fan or not) and will only continue to get better over time as the wider Nest ecosystem evolves. Wi-Fi based home security camera options are everywhere at the moment, with the Google-owned Nest Cam not the first product with its foot in the door, so to speak. We've already seen Withings Home, Netatmo Welcome and Panasonic Nubo to name but a few. 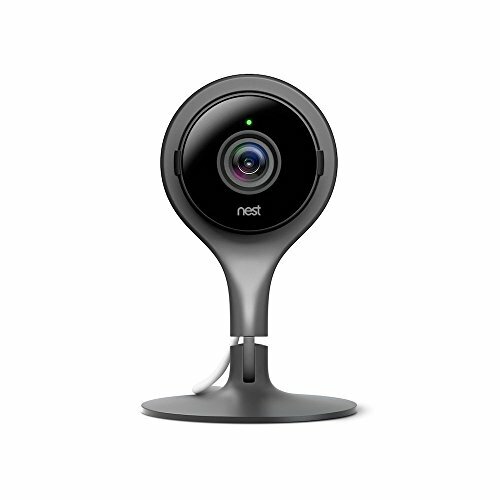 Nest Cam records high-definition footage and, for a monthly/annual fee, can store 10 days of capture in the cloud. It's possible to view what the camera sees in real-time from wherever you are via its mobile app (assuming a connection) for peace of mind, while notifications can alert you to any movement and sound action. So far, so similar: that's what other home security cameras offer too. Where Nest Cam tries to standout is with its communication tie-in with the wider Nest ecosystem, such as the Nest Learning Thermostat and Nest Protect smoke alarm (if, of course, you own such products). As of March 2016 the Thermostat can be made aware of your whereabouts by tracking your smartphone location, which can trigger the way Nest Cam works based on whether you're home or away. This fixes one of the bigger issues we had with Nest Cam when first reviewed. So has Nest now got the edge when it comes to home security, or is it just a big name with little extra to truly offer beyond its competition? Home security cameras range from abysmally unattractive to borderline pretty; no company seems to have quite cracked it yet. Nest Cam tries to stand out with its dark colour and teardrop-esque shape design but, actually, we think it looks rather average. It's an industrial look, not a patch on the good-looking silver-edged Nest Learning Thermostat. In the box Nest Cam comes with a screw-in stand and accompanying base, which can be adhered to the wall if desired. The stand can tilt up and down by 90-degrees each way, while the camera can freely rotate through 360-degrees to compensate for horizontal and vertical positioning as necessary. No vertical videos to be found here. The 130-degree angle of view from the lens is ultra wide-angle, meaning even smaller rooms will fit into its all-seeing eye field of view. There's a mic to listen for sound alerts (which are off by default) and a speaker on the rear which can be used to speak through if you want to shout at the dog for biting the sofa or, who knows, prank your house guest. It's supposed to take a single minute to setup Nest Cam, but it doesn't. Not that it takes so long that you'll be in tears or pulling out your hair, but there are a few steps that need to be taken to get everything sussed out. First, plug the mini USB into the camera so it switches on. We wish this port and cable was hidden out of view as the white cable provided looks eye-catching, and not in a good way. The cable can't be hidden within the stand stem either. Next, download the Nest app on your smart device. As Learning Thermostat users we already have this, so it was just a case of adding a new product. On the back of the Cam is a QR code which can be scanned using your app-loaded device's camera for a supposed quick setup through an associated Wi-Fi network. Setup failed via the app three times in succession for us, though, so we reverted to the browser-based setup on a laptop instead, which worked fine. But all that added to the setup time. Once successful a new circle icon (complete with the name you've give it - ours is “Office”) will appear within the app, so it's possible to toggle between Nest products as applicable. It's a simple yet elegant solution. Nest Cam captures footage up to Full HD (1920 x 1080 resolution) so there's ample detail, with the ability to temporarily enhance (which is just digital zoom) into areas of the image as desired. Nigh Vision is automatic (or can be manually toggled on or off) delivering an impressively clear greyscale image. That's one of the big sells for Nest Cam: the quality of its footage is really good. So whether you're sharing a funny clip of your pet going bananas, or catch a break-in, there's sufficient detail whatever the brightness conditions. Within the full frame if anything moves then Nest will send out a notification alert via the smartphone app (it's not possible to receive email alerts). This is Nest at its simplest, but there are additional ways to detail notifications, including the option to add drawn-on and named Zones (it's only possible to create these polygonal sections from a browser on a computer, though, not within the app). It's then possible to toggle these Zones on and off for notifications, but Nest will always record when it sees motion, it's whether or not you've told the system to notify or not. There's a 2-second lag between live events and when you'll see the image if you're watching live via the app or a browser, while automated recorded sections of footage can be opened and viewed as you please - although the inability to scroll through long clips from the History section with ease is frustrating and not very “Nest” in an app that ought to be more refined. Opening a clip directly from a notification pulls it up fullscreen with enough on-screen controls to scrub through a clip, but this doesn't translate to older historical clips for some reason. Nest Cam review: The Nest big thing? It's possible to schedule when Nest Cam is on and off, in a similar way to the Nest Learning Thermostat. It's even possible to have the Nest Cam come on when the thermostat knows when you're away, putting itself into Away mode. The integration of smartphone GPS tracking for Auto-Away/Home also activates a privacy mode: the Cam symbol in the app now reads "OFF" if it knows you're at home and want some privacy, rather than always (creepily) being recorded. You can deactivate this privacy mode as you please, but we've found it works just fine - typically if our heating is on then we're at home and, therefore, the Cam is now off. Nest Cam is also said to automatically record if the Nest Protect smoke alarm triggers, although that may not be of use if placement of the two devices are in different rooms (and we don't have that product connected to verify this). According to Nest, from its own in-app setup notes, there's also advanced motion sensing which, to quote, “looks for faces while filtering out light, shadows, leaves and trees”. That didn't work for us: it's still never identified a face that we're aware of, while changes in light from passing cloud cover have caused repeat alerts while away on holiday (causing frantic, “what the heck is going on in the office?” moments, only to see nothing but the sun lighting up a patch of wall). With devices such as Netatmo Welcome offering users face registration so they can be recognised and alerts dished out accordingly, Nest isn't necessarily the most advanced home security cam out there. Furthermore the one main issue we've had is outages. These may be network related, or may be overheating related (it runs fairly hot), but if the Cam is offline for a long time it can completely switch itself off and not be remotely accessed. A full-on unplug from the wall to reset it is typically required to solve this. Like so many home security cameras, Nest Cam is only really useful if you subscribe in order to store 10 consecutive days of capture in the cloud. There's a free 90-day trial with each purchase, so you'll get almost three months of use. When that trial time is up, it's still possible to plug into the live view of the camera, but clips aren't going to be stored in the cloud. And with no on-board microSD storage option, those hoping to use Nest Cam as a simple pet monitor, for example, are going to be disappointed. Although we've often called out with other products how on-board recording would be as good as useless if someone broke in, spotted the camera and took it with them. Nest Cam costs £159 in the UK, so it's relatively competitive in the wider order of things. The cloud storage, called Nest Aware, is priced at £8/month of £80/year, so that ongoing cost is the thing to really consider. As home security cameras go it's a familiar tale: Nest Cam has got all the necessary notifications and back-up cloud storage options for a decent core experience, one with great quality Full HD video capture and Night Vision options. There's a lot to be said for expectation though. And with Nest being, well, Nest, we anticipated it was going to be a five-star home security camera. But it'd be a stretch to call it the out-and-out best option going, given the advances other manufacturers have made in facial recognition and related notifications and, in our review situation, recurring outages. It has advanced over time, though, and its real sell is now the ability to communicate better with the wider Nest ecosystem, such as Nest Thermostat, which can even utilise positional data based on smartphone activation (of you and up to 10 family members with separate accounts) to determine whether it's on or off or set to private mode.